I have had National Western Life Insurance ($NWLI) on my radar for some time now. National Western Life Insurance sells life insurance and annuity products including individual, universal, whole, and term plans. The company operates throughout the US, except in New York, and internationally in Central and South America, the Caribbean, Eastern Europe, Asia, and the Pacific Rim. Annuities, sold by independent agents, make up most of its US sales. Some two-thirds of its life insurance premiums come from outside the US, where the company targets wealthy individuals. Investments, mainly in fixed income securities, account for 70% of revenues. CEO Robert Moody, (a member of the powerful Moody family of Galveston, Texas) owns one-third of the company and effectively controls its board of directors. This description from Hoovers sums the company’s profile nicely. As an aside, Hoovers still has what is probably the best business database out there. It has happened more than once that I would find a decent Hoovers profile of some obscure private company, a search for which barely brings up any results in Google. Plus, they have revamped their website to make it more readable and navigable. That’s my anecdotal evidence for Dun & Bradstreet ($DNB) shareholders. Back to NWLI, CEO and Chairman Robert Moody owns approximately 1/3 of the A shares and all of the B shares. The difference between the classes is that Class A picks 1/3 of the directors while Class B picks the rest but gets half the dividends and earnings an A share gets. This is why NWLI is effectively controlled by the Moody’s – Robert (father, CEO), Ross (son, COO), Russell (son, director), and Frances (daughter, director). Robert Moody, 76, started National Western Life Insurance in 1956, having learned the trade under his grandfather, William Lewis Moody, Jr. – the founder of American National Insurance Company ($ANAT) and Moody National Bank (private). The Moody’s are a powerful Texan family with interests in finance, insurance, and philanthropy. Although some people have mixed feelings about controlled companies, in the case of National Western, I think, there are no downsides. The family seems to know something about finance and insurance. The founder CEO learned the business early on and is still at the helm. There won’t be any succession issues. All in all, we have great management that has full control over the company. That’s a good thing. National Western’s strong competitive advantage comes from the well-developed, in the course of 40 years, international operations. They make a solid contribution towards the company’s steady premium and earnings growth. The major international markets include Brazil, Taiwan, Argentina, Venezuela, and Chile. The company has the same stringent risk controls in these markets, or even more so (exposure to big disasters, such as the Japan, Haiti, and Chile earthquakes, was minimal), as in the US market. It minimizes foreign exchange risk by taking payments only in US dollars. Annuities have been the major driver of growth in recent years, especially the ones with an equity index tracking component built in. In the international market, National Western has 25-75% split between annuity vs life premiums and deposits. In the US, the split is 95-5% in favor of the annuity business. International life has shown solid performance over the years. However, despite its efforts, the company has been finding it hard to grow the domestic life segment. Domestic life insurance in force has been declining since 2008. “All other” is mostly made up of the company’s small nursing home operation in Reno, Nevada. On the graph below, you can see the compression in earnings from which the company has been trying to recover since the start of the crisis. Of course, while looking at these graphs, one has to keep in mind that life insurance is a very long-term business, relying on many assumptions that smooth earnings, but occasionally there may be bumps. The domestic life segment has sunk to break-even level. Annuities have also seen reduced profitability. International life stands out as the segment that has weathered the storm best. This just shows the resilience of National Western’s international business and its stabilizing role. International diversification is a big plus for the company. It is also its most profitable segment, as seen below. 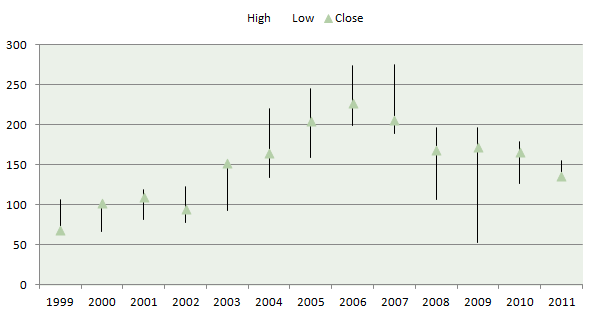 As expected, profitability has declined in the last years of super low interest rates. Yet, international life has continued to provide excellent returns on assets. Overall for the company, return on assets has been 1.2% before the crisis and has dropped to 0.7% on average over the past 4 years. Combined with a pretty constant leverage level of 7x equity capital, the return on equity has averaged 8.2% up to 2007 and then declined to 4.5-5%. Reduced profitability and slowing growth have weighed on the stock price. National Western’s investment portfolio is almost exclusively in fixed income securities – almost all investment grade. Because of the long time horizon of a life insurer and the strong cash flow, the company tends to hold these securities to maturity and not worry about their price fluctuations. Portfolio performance has been very consistent and strong, but inevitably, the low interest rate environment in the past years has affected yields. Yield on average investment has declined from ~7.5% at the start of the decade to ~5.5% now. With policy credited rates fluctuating around 3.5-4.5%, this leaves an interest spread of 1-2%, which isn’t bad or too far from historically experienced spreads. National Western Life Insurance is a an infrequently traded, controlled, no-coverage small-cap. It is a boring, little life insurer in a cozy niche, run by its founder and his family. The company has been delivering consistent profitability over many years while employing no debt. Book value was compounding at 8-9% annually before the crisis. The rate dropped to 6-7% in the years after. 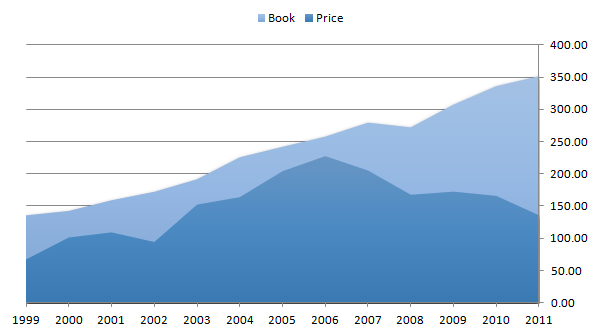 Here is a look at the gap between yearend price and book over time. The gap has never been wider. Book value never stopped increasing, with the exception of a small 2.6% drop in 2008, while stock price has mostly gone down since the start of 2007. Profitability and growth may have declined marginally since the crisis, but I don’t think there are grounds for a 60% gap. Yes, National Western is selling for 40% book. Life insurers at the start of the year were selling for 0.7x book on average, according to Damodaran’s data. Based on my analysis so far, I would think National Western is better than average. On top of this, the average is currently depressed. Assuming only the first part gets adjusted and the company trades up to par with the average life insurer equals a 75% price increase. It may take some time for this repricing to take place because management prefers to build up capital buffers rather than repurchase shares. The dividend is a negligible $0.36, yielding 0.26%, although the company can distribute a lot more without even coming close to regulatory restrictions. This provides the company with a lot of underwriting capacity that it is, and will be, deploying to grow its business. But, shareholders will have to wait for this value to be recognized by the market and hope the extra capital won’t result in relaxed risk standards. The latter is not likely, given the company’s successful past and its capable, seasoned management. The lack of analyst coverage and the full control by the CEO are two more factors that suggest a slower rather than faster realization of the fair value. So, this will be a stock for the more patient investors. Here is how price has moved in the past 13 years. Brazilian insurance regulators have sought to impose substantial penal fines against National Western Life Insurance Company. The Company firmly believes that Brazilian insurance regulators have no jurisdiction over the Company and that any such fines would be unenforceable against it. As reported in the Company’s Form 10-Q filing for the quarter ended September 30, 2011, Brazilian insurance regulators publicly stated their intention to curtail the sales activity of certain foreign multinational insurers, including National Western, and attempt to levy fines. This public announcement has served to decrease the number of new applications for insurance from residents of Brazil since that time. From what I read, the claim is most likely just flexing muscles on behalf of the regulator. The amount seems highly incredible at 5x the company’s capital. If the threat were credible, it certainly would have affected both the stock price and A.M. Best’s financial strength rating of A (Excellent) with a stable outlook, reiterated on May 31, 2012. Yet, Brazil is National Western’s largest foreign market – about the annual size (by premiums and contract revenues) of the next 3 largest markets. As the company admits, this case is damaging and has led to a “decrease [in] the number of new applications for insurance from residents of Brazil.” Even if there is no big effect on the company, the fact that management hasn’t been more open about a seemingly big issue in its largest foreign market undermines the confidence I had in it. 1) price was consistently at 20% discount to book value. This reminds me of the classic closed end fund puzzle which we also observe in publicly traded private equity investment trusts. For the sake of conservative valuation I would take that into account. What do you think? 2) have you produced an earnings based valuation. I think a 10x EBIT multiple would be a good starting point. What do you think? Sorry for the late reply. I am not yet used to following the comments on my own blog, which is why I encourage people to “Speak up” and start an email conversation. On question #1, yes, the company has been generally trading at a discount to book. As I’ve said in the post, I think NWLI is a better than average insurer and thus, should trade above the average multiple of book value for life insurers. This alone grants over 75% appreciation. Using 10x normalized EBIT yields the same valuation as 0.7x book, so I guess it is just as good a starting point. But it could be more unpredictable going forward. How will business in Brazil go on? What about in other international markets?